Since Trump won the presidency in 2016, America’s become unhinged. One could say both sides are more polarized now than they’ve ever been (like the fact that there are “two sides” to everything instead of multiple camps), and it’s becoming uglier by the second. And who’s leading the charge from the far-left? It’s invaded Silicon Valley, Hollywood, and the highest levels of the U.S. government. We can’t seem to get away from it. And the funny thing is that most people think it’s a joke. Only one-fifth of Americans identify as feminists. But the vast majority fit the basic definition of the word. 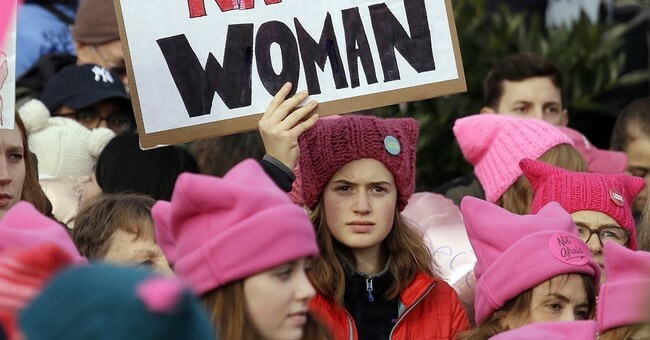 According to the survey, just 20 percent of Americans — including 23 percent of women and 16 percent of men — consider themselves feminists. Another 8 percent consider themselves anti-feminists, while 63 percent said they are neither. And what you see is just pure hate (definitely not Susan B. Anthony’s feminism). Heck, there’s even one called “Feminist Baby,” for crying out loud. These books aren’t about equal rights for women. We already won that fight. These books are about hating white men, Trump, traditional morality, and masculinity. The new feminism wants to dismantle the nuclear family, the housewife, masculinity, gender roles, and true femininity (you know, the kind where women look and act like women). In short, the new feminism isn’t about “real feminism” at all. Not true of the new feminists. In fact, the new feminists are more akin to a Karl Marx than Rosa Parks. The new feminists are advocating for violence, hate, discrimination, prejudice, and censorship — not for women’s rights. Besides, we already have women’s rights in the States. That was taken care of decades ago. So maybe these new “feminists” should go to some lesser-developed countries if they want to do some real good (I hear Turkmenistan is lovely in the Fall). Because the countries where the idea of feminism actually makes sense are the ones where women can’t have jobs, drive, go to school, or show their faces. In the states, it’s just not needed. But you’d think we’re living in medieval times here when you listen to the feminists rage against the machine. So, Why Is the "Anti-Feminist" Movement Not as Loud? Well, for starters, the powers that be are suppressing and censoring them. The three biggest influencers of culture (tech, media, and Hollywood) are dominated by radical feminists. Heck, we even had Madonna threaten to blow up the White House after Trump was elected! Whoever controls the narrative, controls the culture. And with the narrative being so carefully and aggressively trumpeted by leftists, it’s no wonder why the anti-feminist camp is having such a tough time being heard. If you do a search for “anti-feminist book” on Amazon you only get 356 results (and MOST of the results are STILL pro-feminist books). To take it one step further, if you search for an “anti-feminist kids book,” you get ZERO RESULTS. You can get books on teaching your little girls how to rail against the patriarchy, but if you want one unpacking the ridiculousness of third wave feminism, you can’t find one. Bottom line: the imbalance in this space is mind-boggling. This is also why I wrote the very first kids book on the topic, and, if you’d like, you can get in here on Amazon. So, this radical feminism…it’s not just on Amazon. And the political climate we’re living in right now would suggest that our culture is extremely divided between the radical left and the old-school conservatives. It’s really a battle for the future of America. Radical feminism is one of socialism’s top battlefield generals. And for being so small numerically, it’s making quite a mess out there. …America became a great nation, because we were a 'can do’ nation. Now we’re becoming a ‘what can you do for me’ nation. So seeing all those things, plus the rapid rise of political correctness, which is stifling one of the basic tenets of our country — our freedom of speech — just alarmed me significantly. To be conservative means maximum freedom. It means small government. It means the preservation of the institutions and ideas that lend themselves to human flourishing. In other words, we need to fight for the very things that radical feminism wants to destroy. Thankfully, the silent majority is starting to speak up. And, no, it’s not just white men doing so. The new and vocal ‘anti-feminist’ movement is made up of women and men from all ethnicities and socioeconomic backgrounds. Black women like Candace Owens, gay men like Milo Yiannopoulos, atheists like Carl Benjamin, and even trans people like Blair White are fighting against the plague of feminism in the West. Because you don’t have to be a conservative, Christian, white male to recognize that the "new feminism” is bad for America. Because people everywhere are sick of being taught to hate white men, hate marriage, and hate the system. Because people everywhere are sick of hearing about non-issues like mansplaining, manspreading, and the “wage gap” theory. Because people everywhere don’t think that the “patriarchy” is a real thing or that it’s out to get them. This begs the question, can the anti-feminist movement make America great again? Can it rip us out of the closing jaws of progressivism and political correctness? …standing against the wall not bothering anyone in the marketplace of ideas. Want to keep the conversation going? Leave a comment, share, and join Brian on Instagram here.